I sat down with my husband a few nights ago to talk about some things that were on my mind. The anxiety had been building up in my soul over the last week, that feeling you get when your breath begins to get shorter and shorter, your movements begin to get faster and faster, and you realize you have to stop if you want to remember what a deep breath feels like. What do I want my life to look like in five years? The question stopped me in my tracks because I legitimately hadn’t considered it before. I’ve thought about what I want my life to be like when I’m 80, but what it should look like when I’m 38? I took some time to think about it, and answered him. For the first time, I was able to see past next week and begin to dream about the not-so-far-off future. And that one action brought the clarity I’d been lacking. I’m a planner by nature, a goal-setter who likes to see a clear path to the things I’m pursuing. I like having everything mapped out. I like concrete, tangible progress. As I grow older, though, I’m learning that life just doesn’t work that way. The path is rarely clear, and the map I’m holding has so many roads crossed out, I can barely make out which one is mine anymore. I’m learning that good goal-setting is less concrete and tangible and more flexible and flowing. It’s little by little progress, not perfection. It’s two steps forward, then one step back, and maybe a few to the right, then a couple to the left, then back on track. Good goals are goals wrapped in grace, not bound in rigidity. Good goals are goals that will matter not only today, but also next week, and then when I’m 38, and still when I’m 80. And I’ll tell you a secret: Good goals are a whole lot easier to make progress on than “perfect” goals. Setting good goals requires four things: a little time, a little prayer, a great notebook, and your favorite pen. When I’m looking forward to a new season, and ready to set some goals, I take a little time away. I head to a coffee shop for a few hours, or to the beach, and I sit with my Bible open and pray. I ask the Lord what really matters to Him, I read His word, and then I start dreaming. Instead of a notebook, I usually use my favorite goal-setting workbook: PowerSheets. 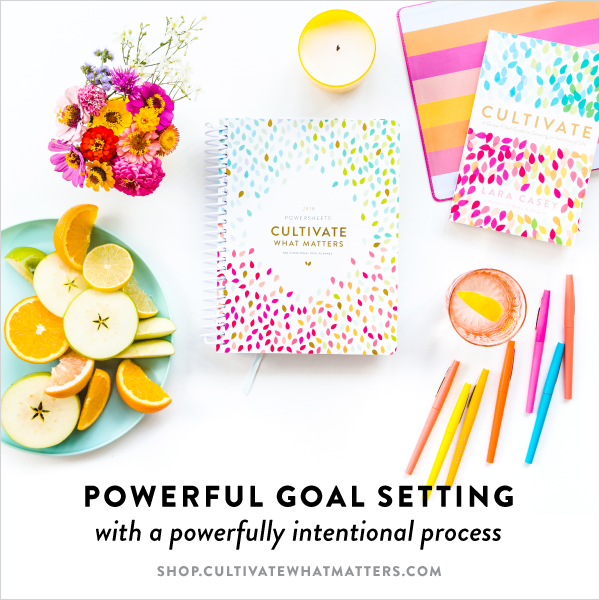 PowerSheets are a collection of worksheets that help you intentionally walk through the process of setting goals that matter. They prompt you to look back at your last season, figure out what worked and what didn’t, and help you move forward in a practical, doable way. More than that, PowerSheets help you dig in and do the hard work of figuring out what really matters to you in that season, and then pursue those things with focus, leaving the rest behind you. You can totally do this in a regular notebook, on your own, but I prefer PowerSheets, because they ask me questions I wouldn’t have thought of, and challenge me to dig into places I hadn’t considered. I have not found any other tool that helps me find clarity the way that PowerSheets do. Are you ready to set some good goals? I know it’s only October, but I really believe that making progress on the things that matter is something you can start anytime. Yes, you could wait until January 1st, but why would you, when you can start today? 1. Join our FREE Grace-Filled Goal Setting Challenge. 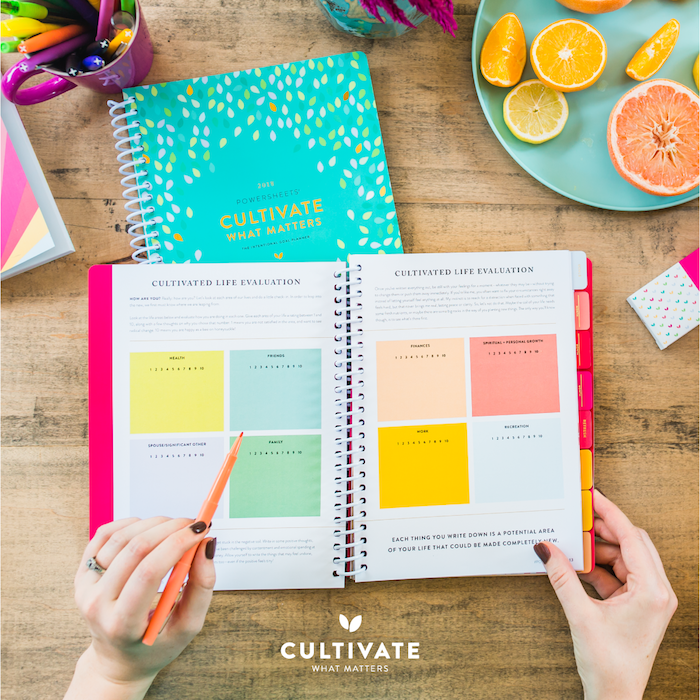 It’s a week of grace-filled goal setting tips, helping you learn how to quiet your to-do list so that you can stop living like a slave to all of your “urgent” tasks, and actually start making time and taking realistic steps toward what matters most. >>> Join the challenge HERE. 2. Grab your OWN set of PowerSheets! I’m thrilled to announce that the 2018 PowerSheets are now available!! I use them myself and HIGHLY recommend them to everyone. You can see how I use mine HERE & see how I integrate them right into my daily planner HERE. And when you’re ready (or now!!) you can get a set of PowerSheets for yourself! >>> Get your own PowerSheets HERE. Setting good goals, and making progress on them, is something we can do even when we’re feeling overwhelmed. In fact, I think that place of being overwhelmed is exactly the right place to start. If I can do it, you can do it, and I’d love to help. Don’t forget to grab your PowerSheets, and join us for the Grace-Filled Goal Setting Challenge! I can’t wait to help you walk through figuring out what matters, setting good goals, and letting go of the rest. You can do this, friend! Set realistic goals that matter this year! Join us for a week of grace-filled goal setting tips! It’s going to be all about quieting our to-do lists so that we can stop living like a slave to all of our “urgent” tasks, and actually start making time and taking realistic steps toward what matters most. « The 2017 Holiday Planner is here!